Another successful net on the Fusion System, if you’re interested in some of the radios we use, please visit this page for more information. If you have questions, please meet us on the Tuesday evening net at 9.00pm local time. Our first C4FM Fusion net was held, we first went analog to talk about the Fusion system to allow questions from operators and replies from Fusion experienced users. The net went without hitch and we even swapped out over to C4FM to test and setup equipment. With which all tests and communications went well. We shall be running this net every Tuesday at 9.00pm local time, and your net control operator is Spence and from time to time could be many other operators. Please do join us, you do not have to have a System Fusion radio to join in with the net. If you do not have a System Fusion radio, please ask questions if you are interested or just hang out and listen. If you want to know what radios that you can use on System Fusion, please take a look at our repeater page for more information. Josh (KC8TAI) and Myself (KD8YNY) have been working on APRS coverage for the Morgantown and surrounding areas. Along with the help of Steven (N8URE), we are starting to form some good coverage from Bruceton Mills and Morgantown. We are hoping for more operators in the area to at least get more RX/iGates up on the air. We are also in plans for APRS back up at the repeater site for more coverage of PA and more of the surrounding areas. Take a look at WT8WV’s blog, he has added a number of really good System Fusion video links. Here is a direct link to his blog’s search results when you search for fusion. https://kb8fir.wordpress.com/?s=fusion. Below is a video of the event, we had a great day. 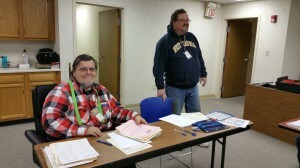 Bob West, WA8YCD taught the antenna building workshop. Jim Seckel, KC8YUI took charge of the bunny hunt. Mig Crowe, K8MIG, set up our information table. The WVU Amateur Radio Club also participated in the event. Special thanks to all participants and our club members who were on hand to help. Our VE session went well, 3 individuals took exams. One person passed their technician exam and two other individuals passed their extra exam. Roy Nutter, N8BHI gave a presentation titled, “What is all this stuff about battery fires?”. The slides and links to the videos from the presentation can be found here. During our January 19, 2016 meeting we had a great turn out for the VE session. Thirteen individuals took exams. Out of the 13 who took the amateur radio exams. Four people passed the technician amateur radio license exam, three people upgraded to general class and four upgraded to extra class. Special thanks to our VE coordinator Bob West (WA8YCD) and the rest of the VE’s who graded the exams and helped out with the paperwork. WA8YCD-Bob West preparing for the VE Session.